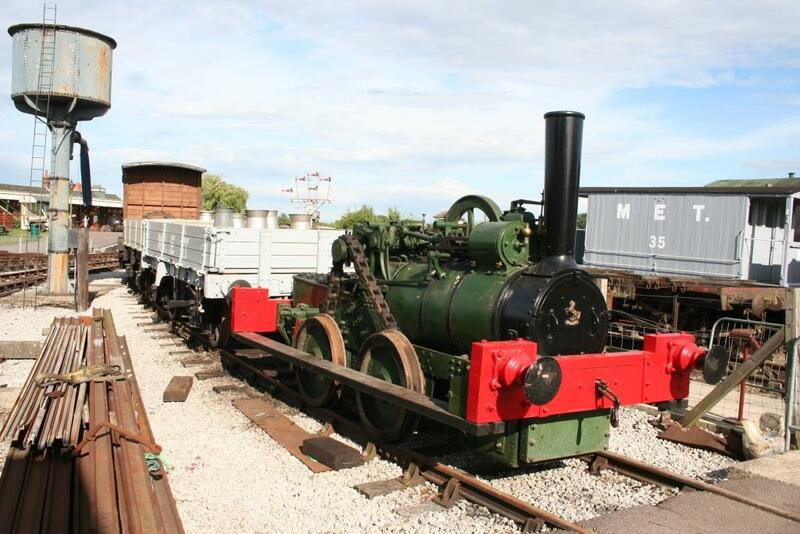 This locomotive, built by Aveling & Porter, Rochester, Kent, who are better known for their traction engines, it is a "cousin" of Quainton's Sydenham. No. 807 has a single cylinder mounted on top of the boiler, is surrounded by a steam jacket. Motive power is transmitted from the transverse crankshaft by spur gearing to a countershaft carrying a chain sprocket at the other end. The final drive to the wheels is by a chain passed around the sprocket and a chain wheel mounted on each axle behind the driving wheels, which are thus coupled together. The countershaft bearings are located in curved slots in the supporting brackets, to give a means of adjusting the tension of the driving chain. A heavy flywheel is mounted on the crankshaft. No. 807 was one of a pair of Aveling & Porter locomotives which worked on the Wotton Tramway, later known as the Brill Branch. No. 807 was supplied in January 1872 and its counterpart No. 846 in the following June at a price of £400 each. Being only capable of 4 mph they were deemed not man enough when it became a branch line rather than a private railway. Consequently both were withdrawn in 1894 and were replaced on the Brill tramway by two Manning Wardle K-Class saddle tank locomotives. No. 807 was obtained by the Blisworth and Stowe Brick & Tile Co. Ltd. (latterly Henry Martin Ltd.) and used at the Nether Heyford Brickworks (Northamptonshire). The brickworks closed in 1940 and was used as an ammunition store by the War Department. No. 807 survived the war, being stored until 1950. Its counterpart No. 846 failed to pass a boiler inspection early in its brickyard life and was subsequently cannibalised to provide spares for the surviving locomotive. The Industrial Locomotive Society purchased the locomotive, and in 1951 London Transport agreed to hold it in safe custody at Neasden Depot until a final home was ready for it. The locomotive had been cosmetically restored by London Transport craftsmen, as far as possible to its original condition and livery. In 1957 it was officially handed over to the British Transport Commission for display at the Museum of British Transport, Clapham. It was transferred to Covent Garden in 1980, when the London Transport Museum opened. 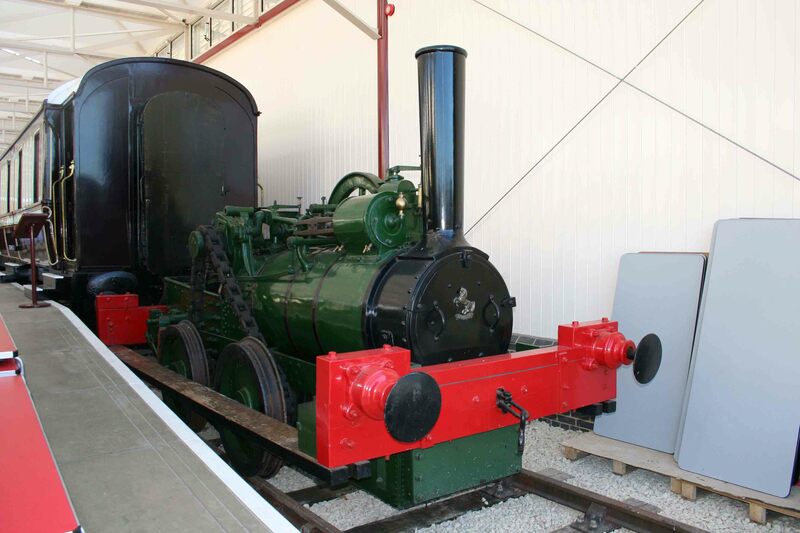 Whilst the London Transport Museum was closed for a £18.6 million refurbishment Brill was loaned to Quainton and displayed in Rewley Road. The original intention was that Brill would return to Covert Garden in late 2007 when the refurbishment was completed. However, its loan to Quainton has been extended. During the August 2013 Metropolitan 150 celebrations at Quainton No. 807 appeared in the Down Yard with the Beckton Dumb buffered Wagon and the Metropolitan Railway 10 ton Wagon No. BW4, with the replica Brill coach. Both the Beckton Wagon and the Metropolitan Wagon have grease axle boxes. The boiler is fed by a pump worked by an eccentric on the crankshaft. A water tank is situated under each end, coupled by a pipe. Tractive Effort :- 6 hp Boiler Pressure :- Cylinder Dimensions :- 7 ¾" x 10"